Impressive Equi Te comes to us from the estate of our beloved friend, the late Keith Tyler, Desert Snow Ranch located in Eden, Utah. He is now owned by Mr. Robert Jimenez and BTC. We are thrilled to have him. Impressive Equi Te is a superior halter horse with 90 open halter points. He has 11 Grand Championships and 14 Reserve Grand Championships. His get are multiple futurity winners and money earners. 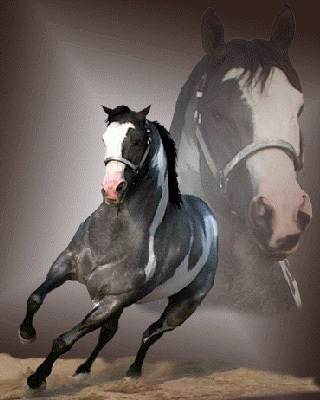 His pedigree includes APHA Champion and superior halter horse Lucky's Diamond Te, Impressive and, Te N' Te. In addition, he is a rare homozygous Black, Blue Roan overo. UC Davis tested. 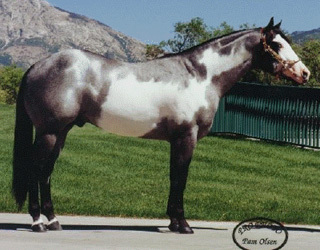 'Equi Te' has been donated to the Temecula Valley Paint Horse Club , the Utah Paint Horse Club, Norco Horse Show Associates, Central California Paint Horse Club and Golden State Palomino Association stallion service auctions for 2007.